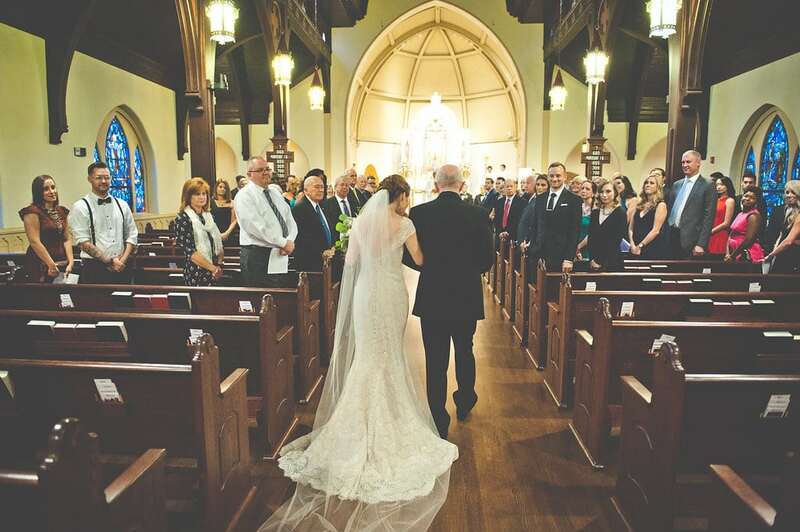 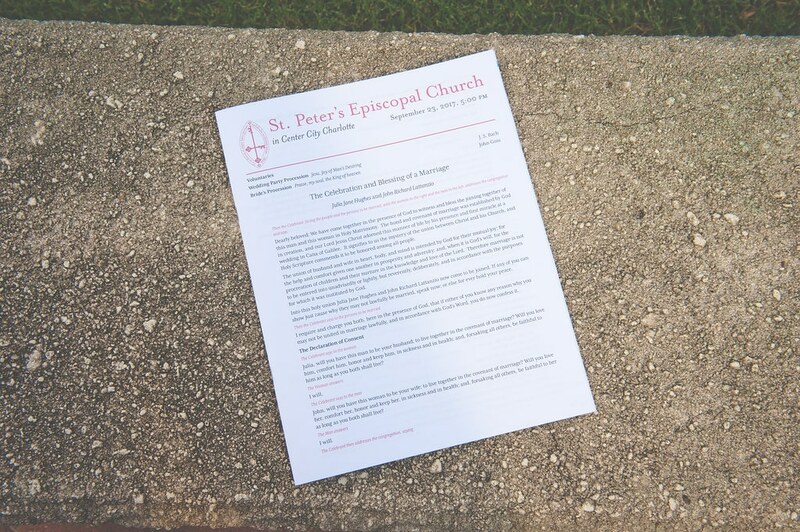 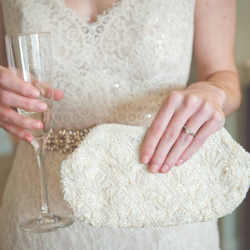 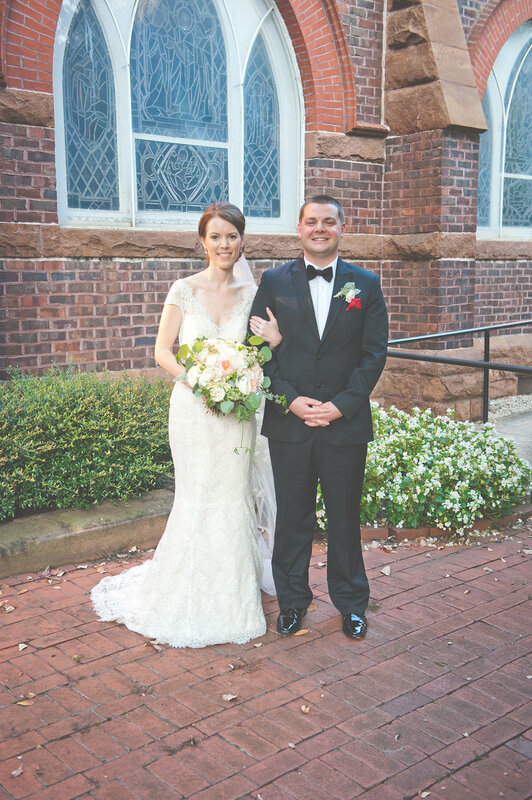 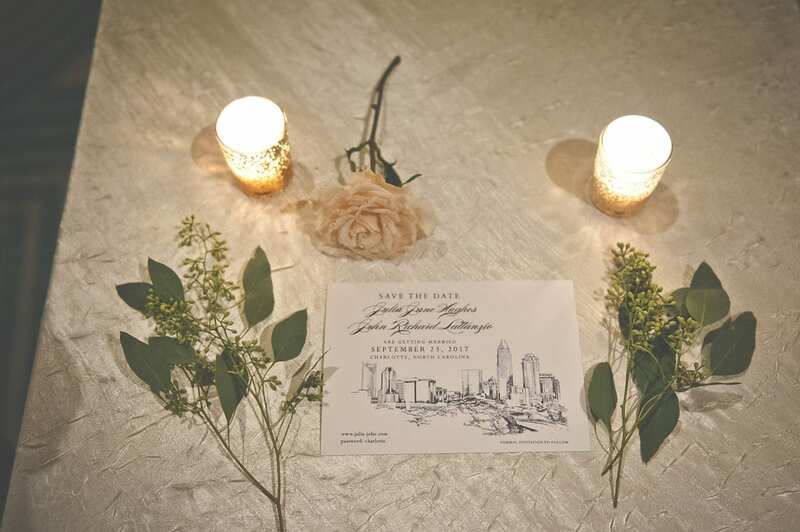 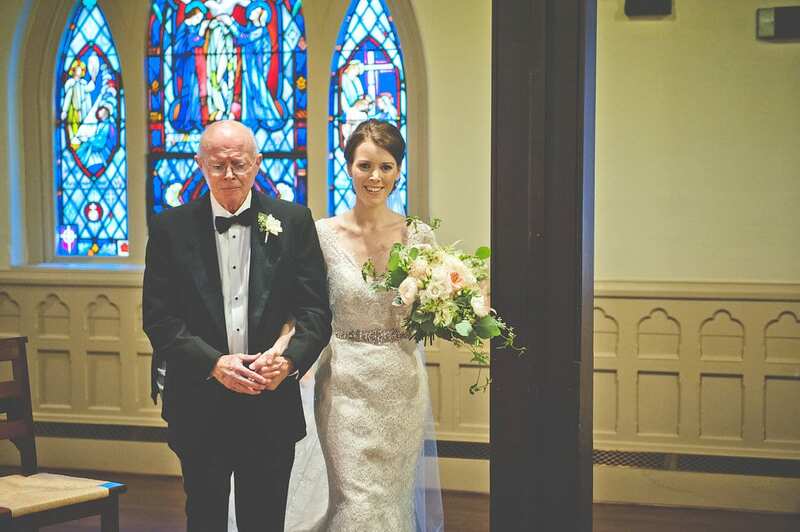 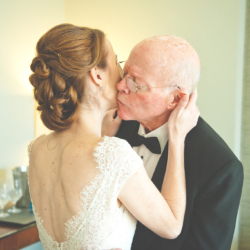 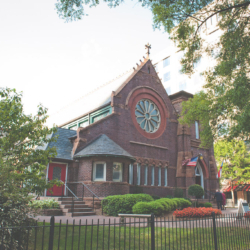 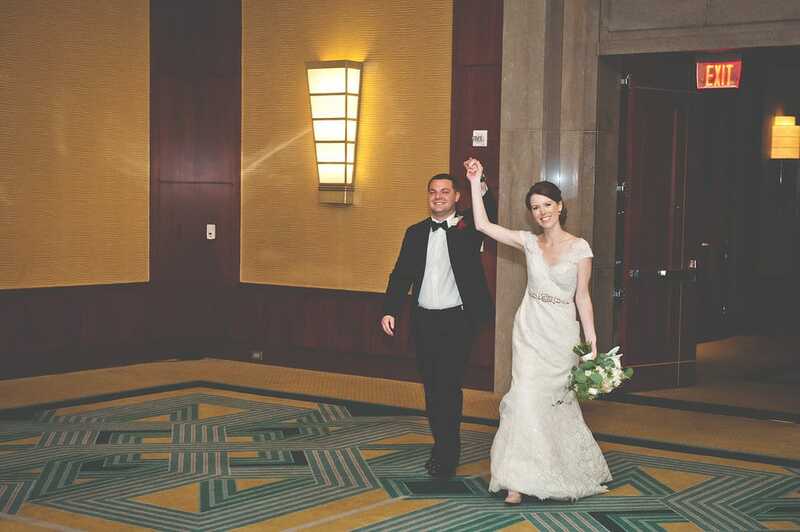 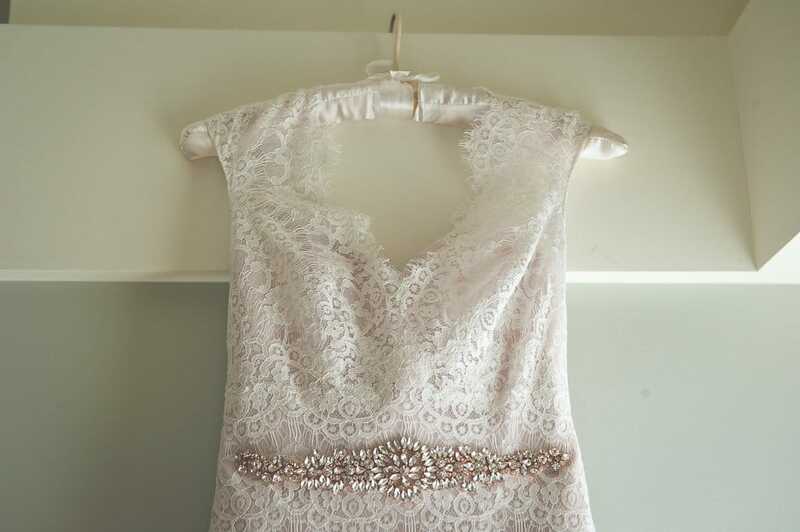 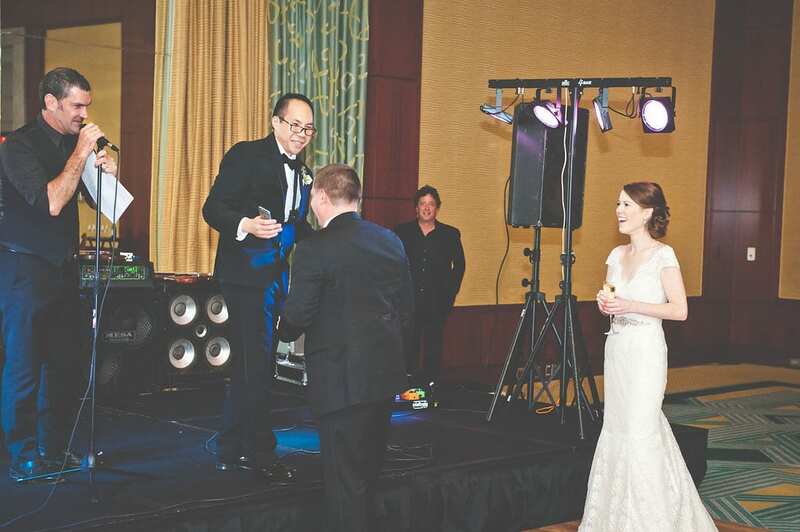 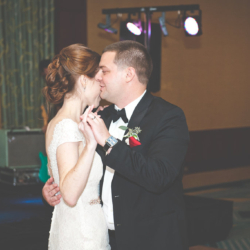 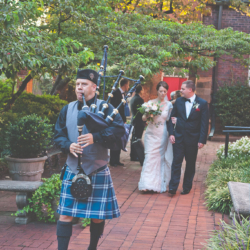 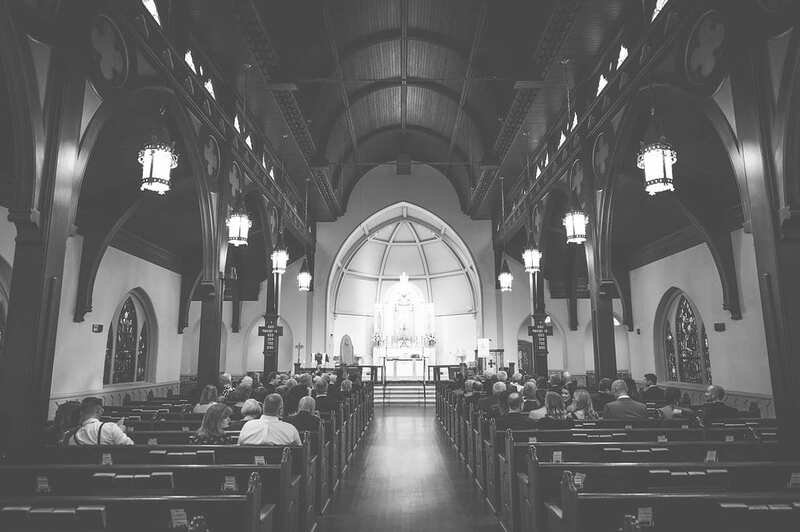 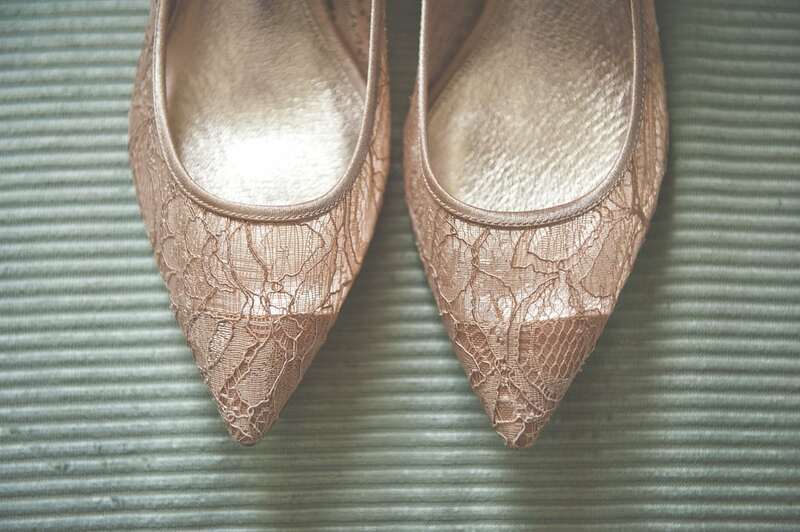 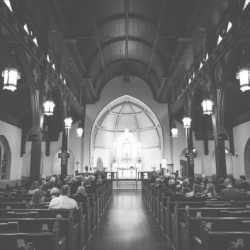 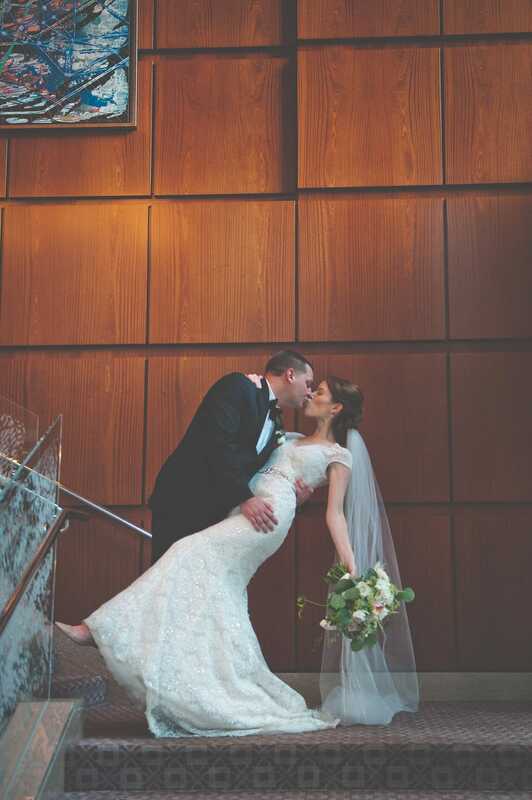 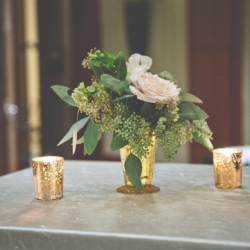 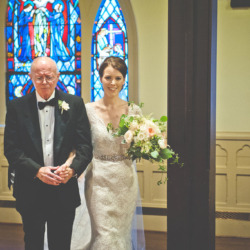 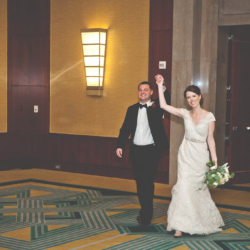 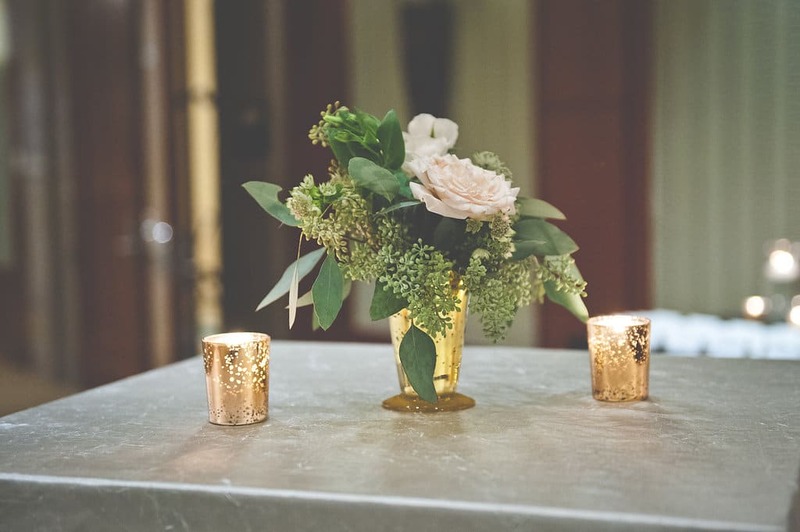 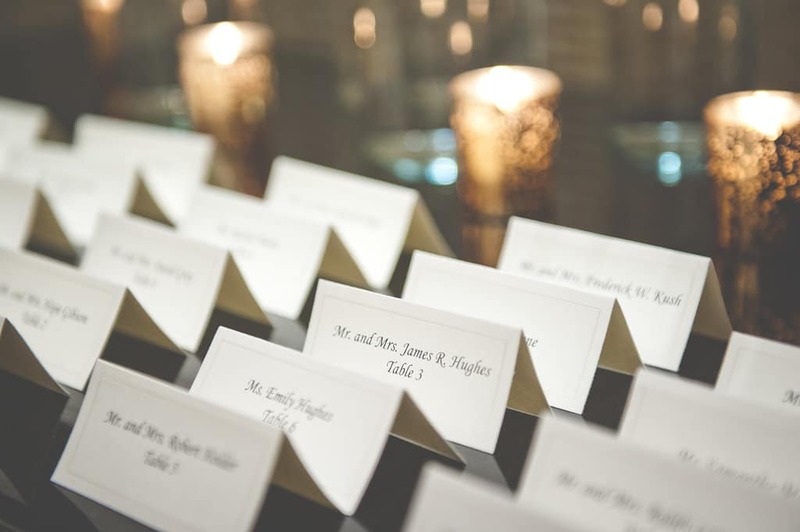 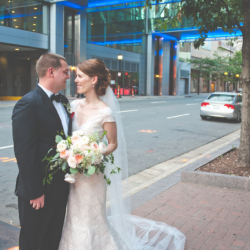 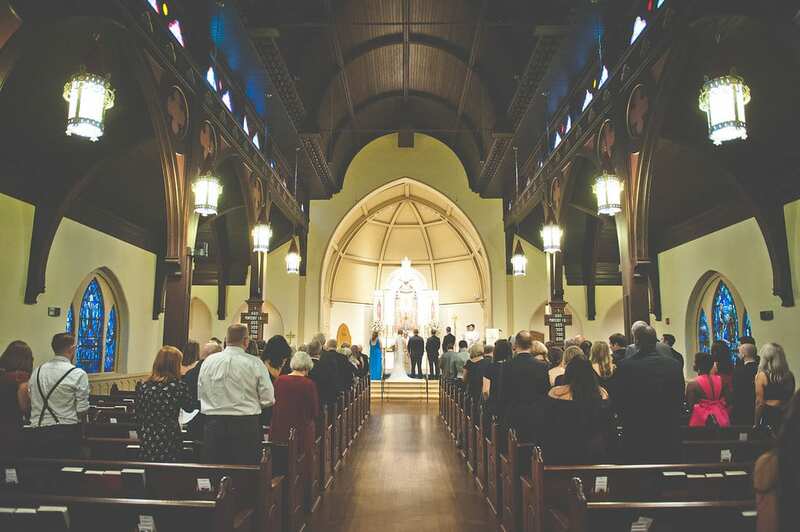 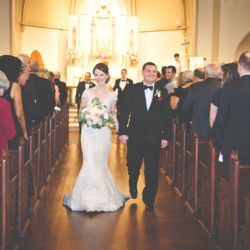 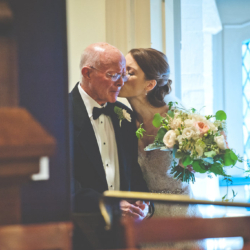 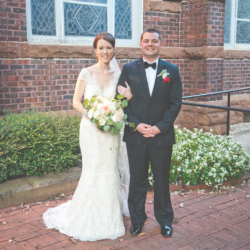 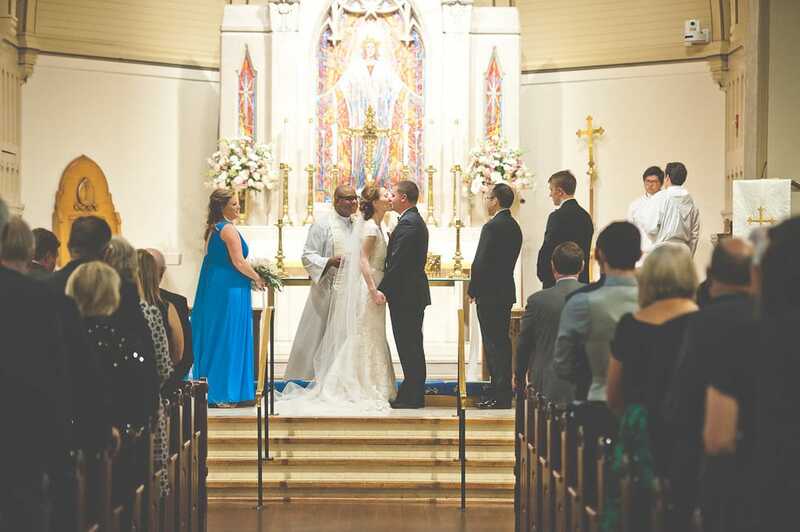 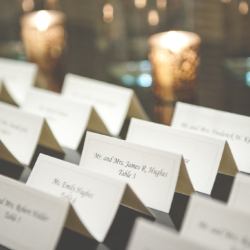 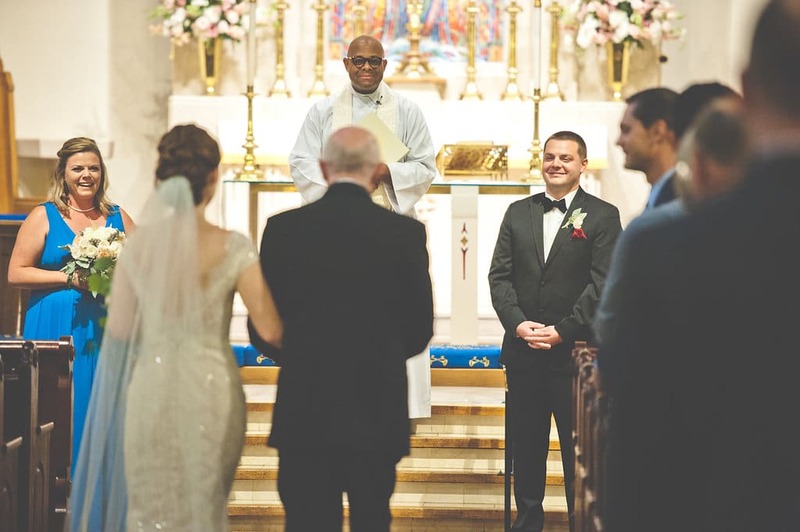 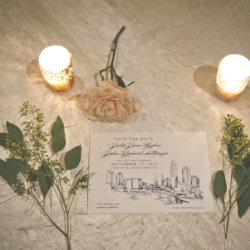 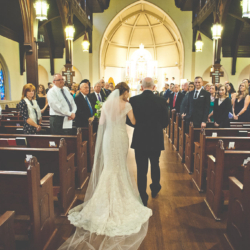 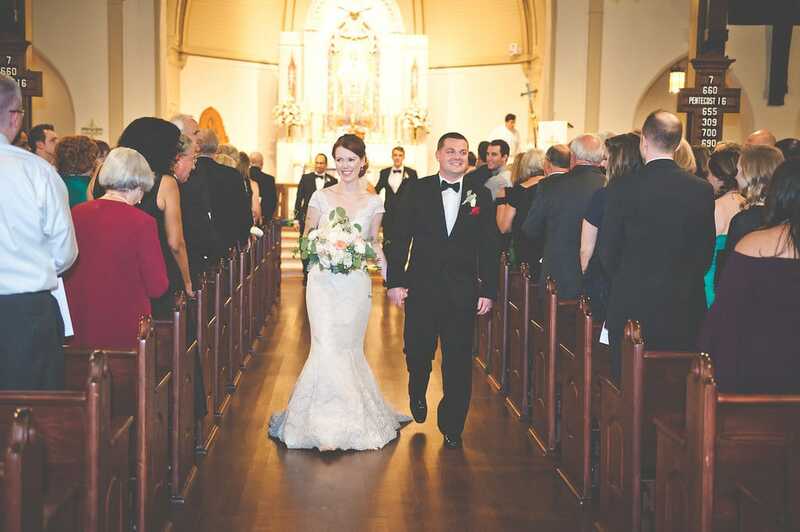 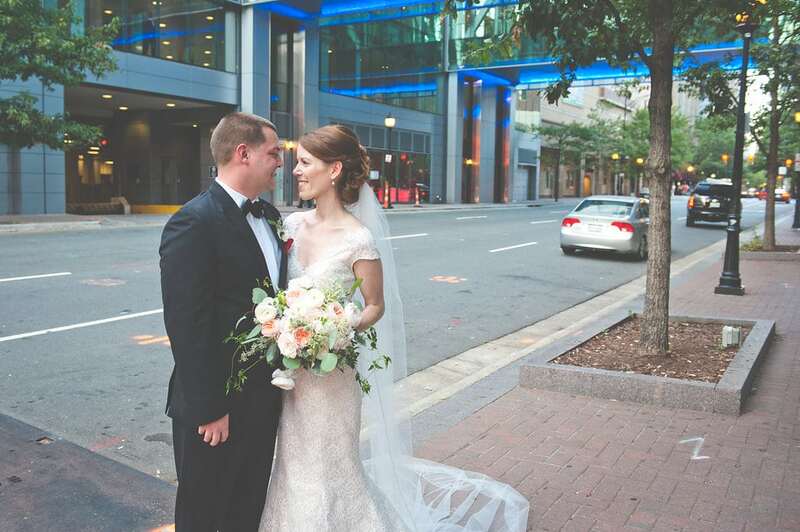 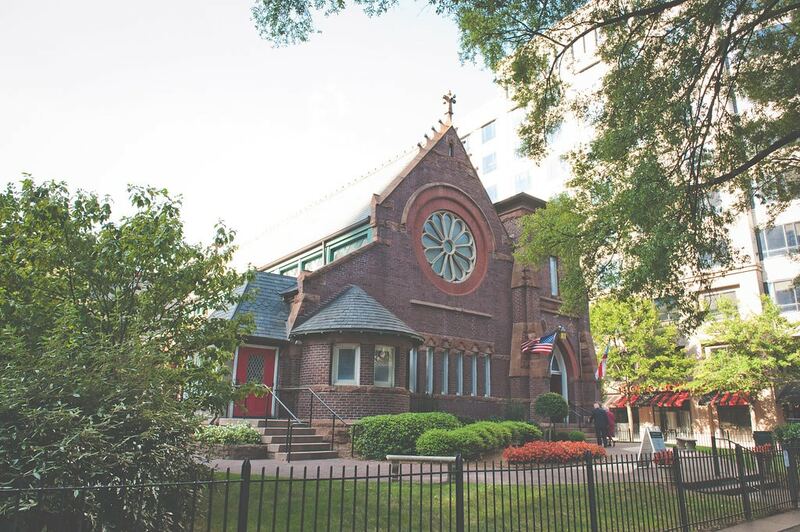 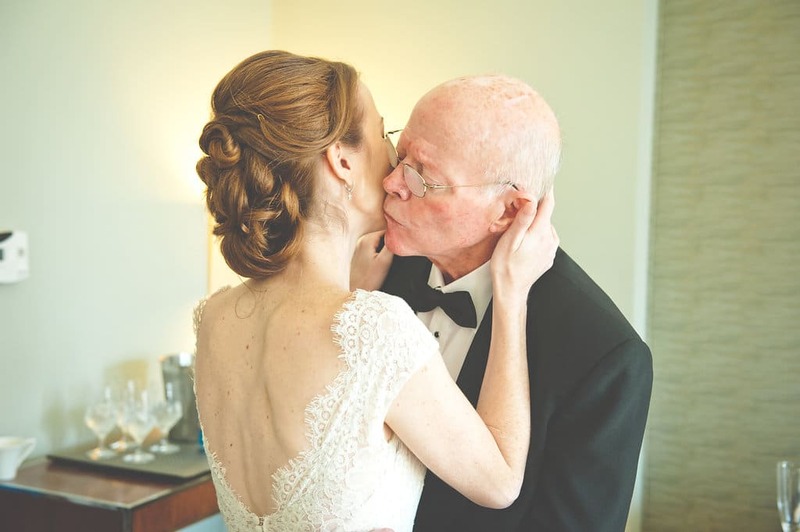 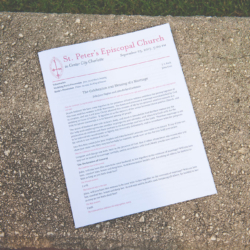 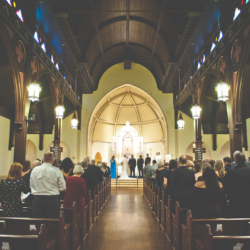 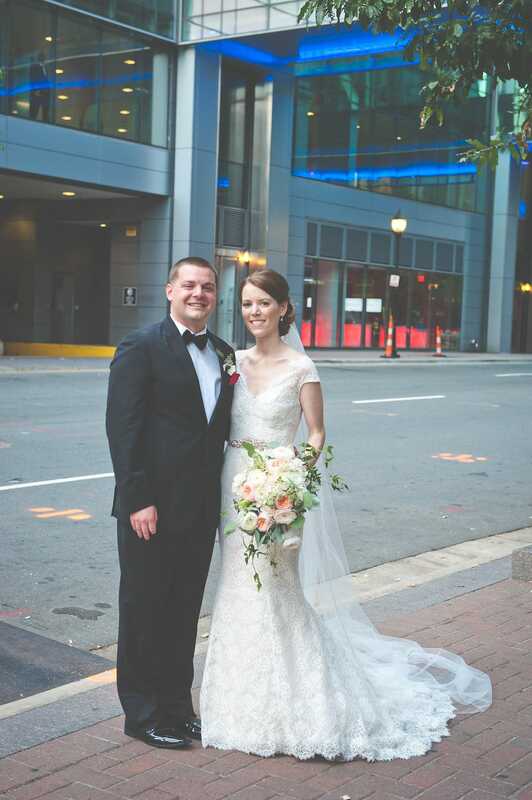 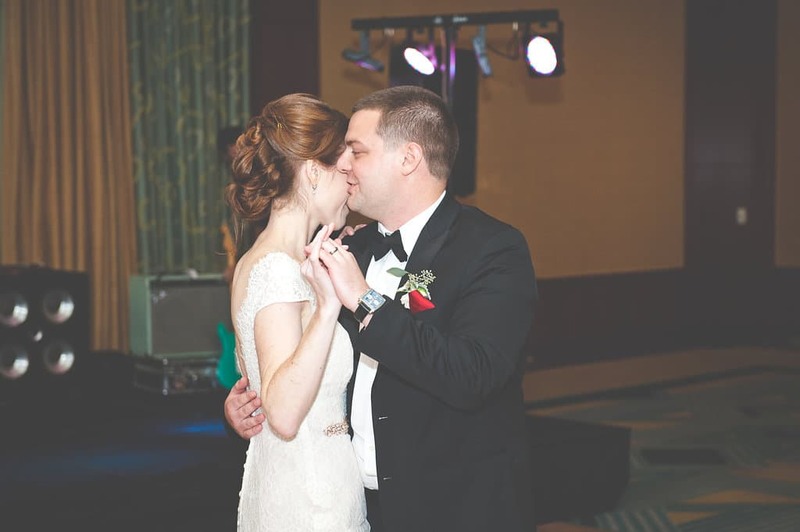 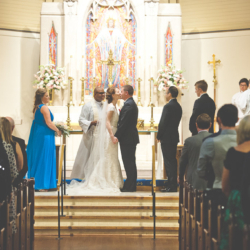 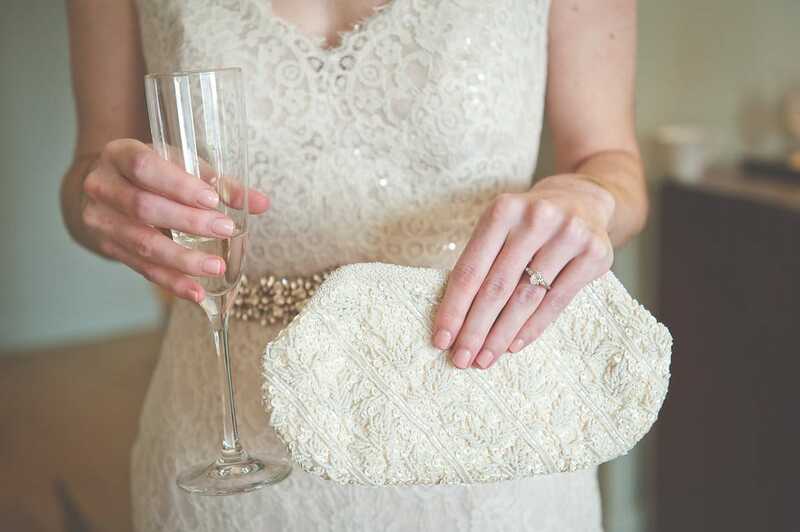 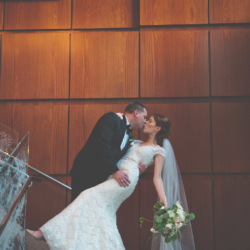 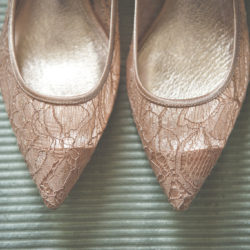 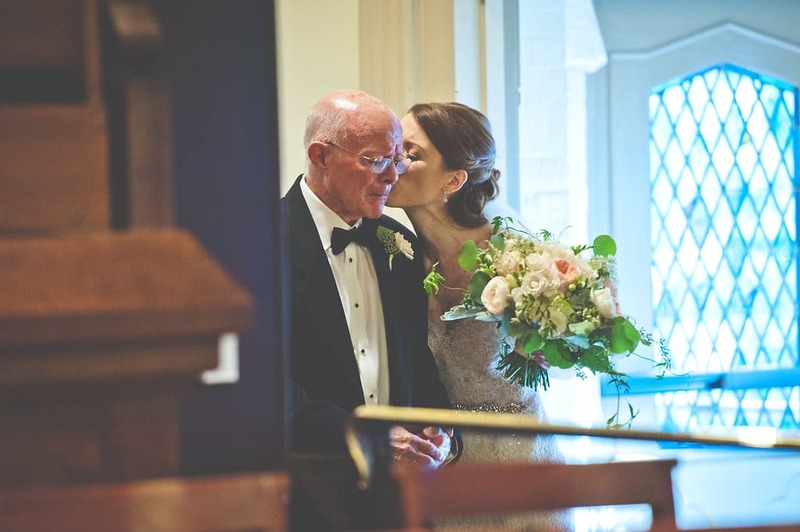 Julia and John were married at St. Peter’s Episcopal Church with a reception at the Ritz Carlton in Uptown Charlotte. 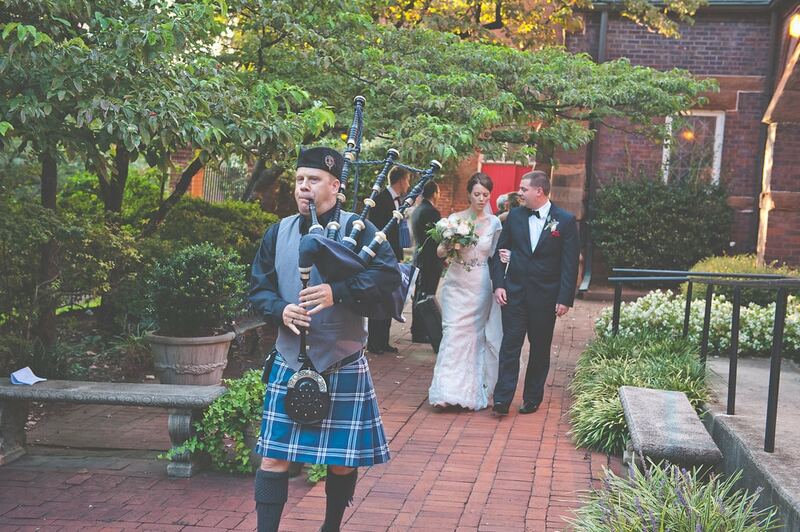 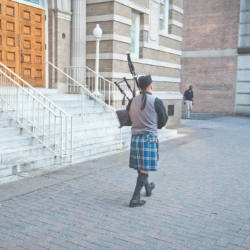 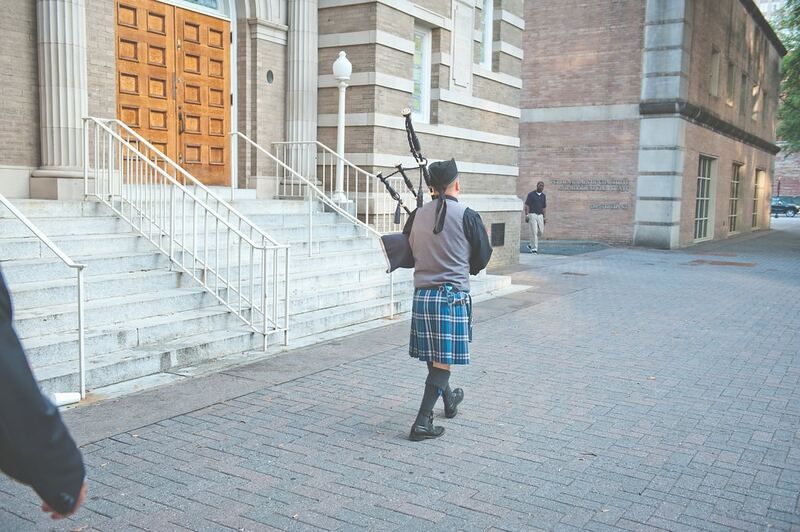 They had a bagpiper lead them from the church to the reception, and it was so much fun to walk the line! 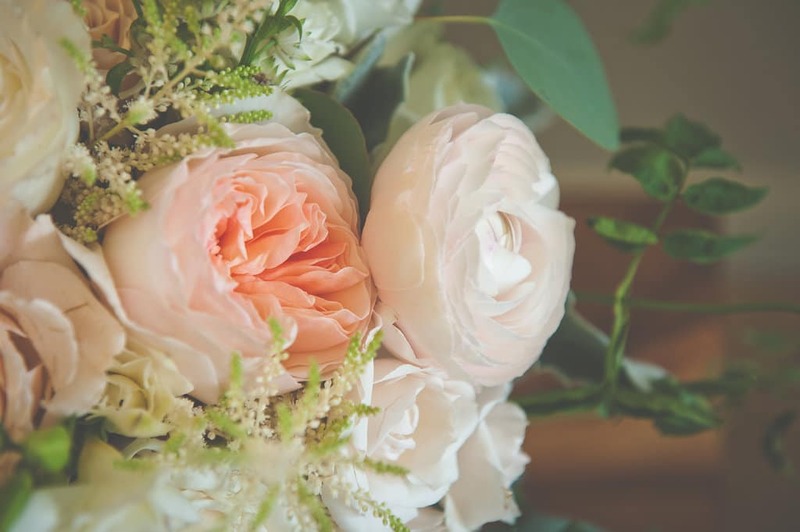 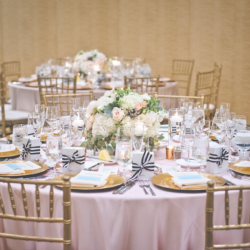 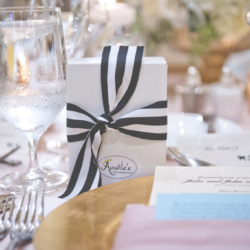 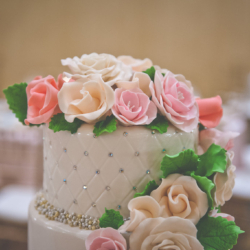 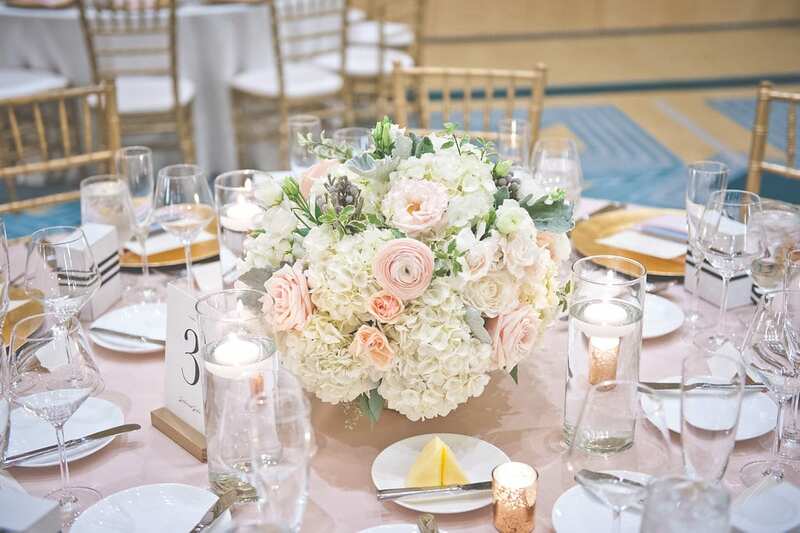 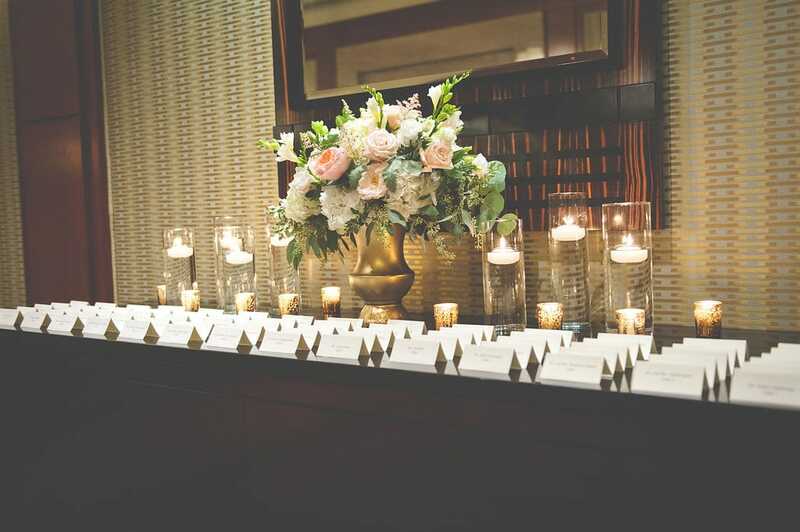 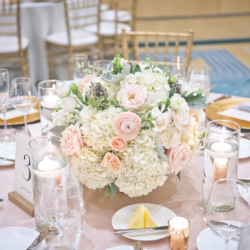 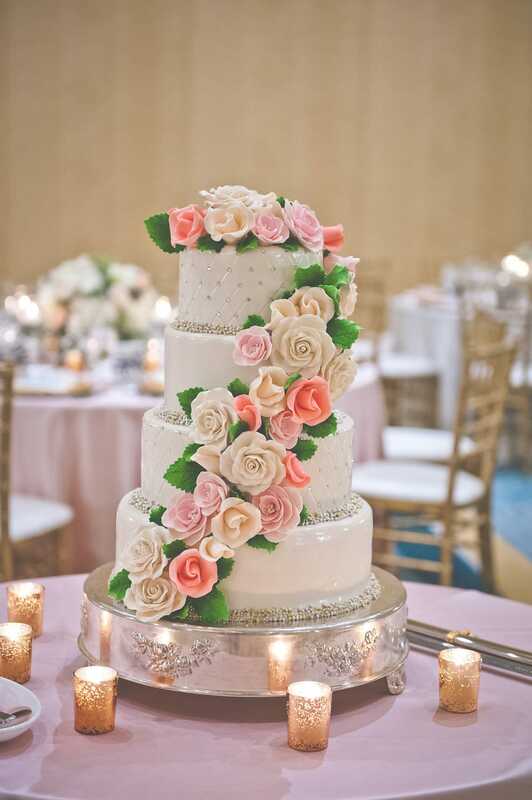 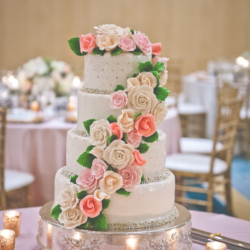 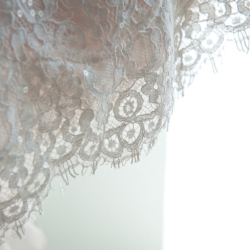 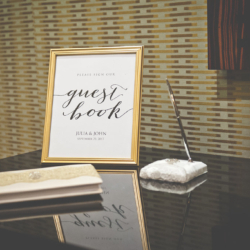 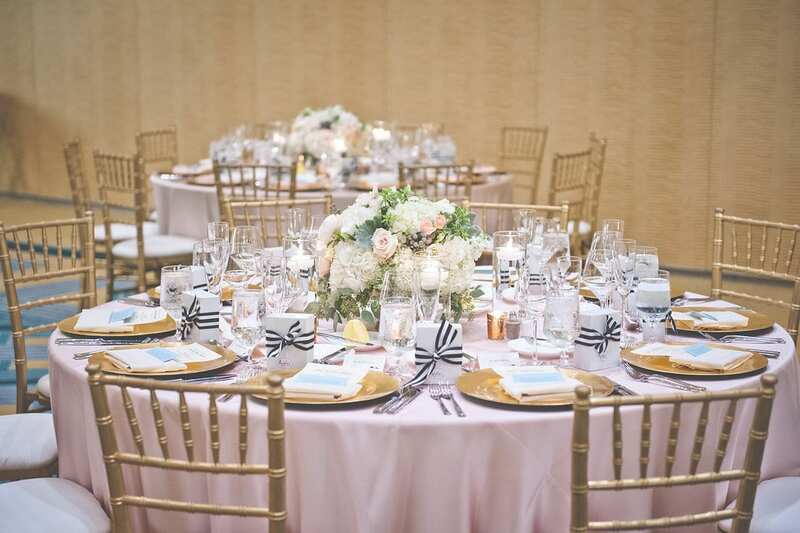 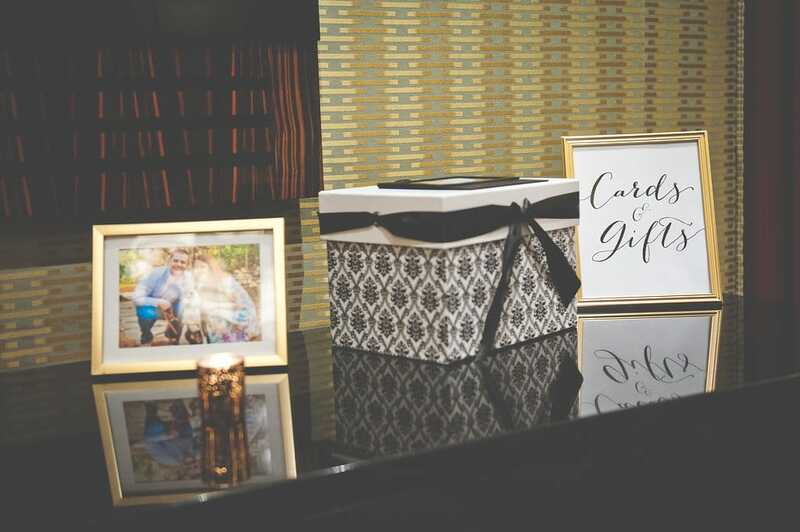 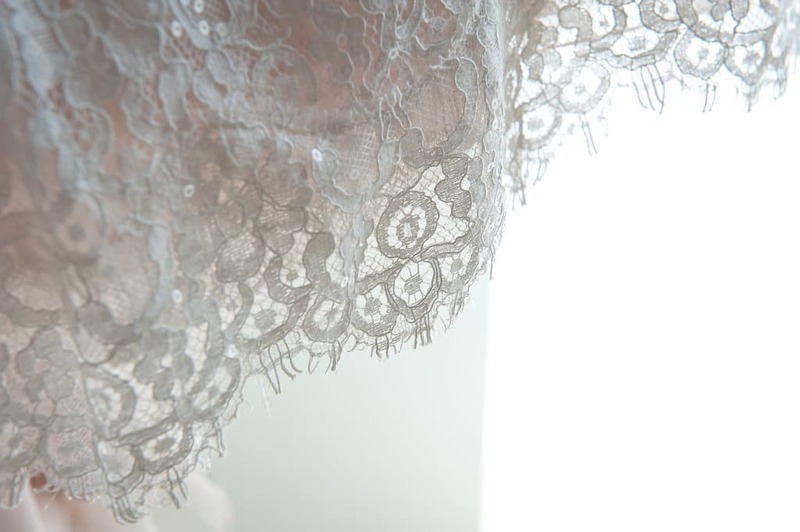 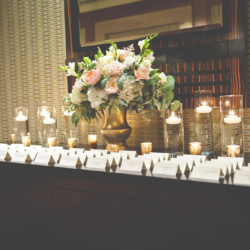 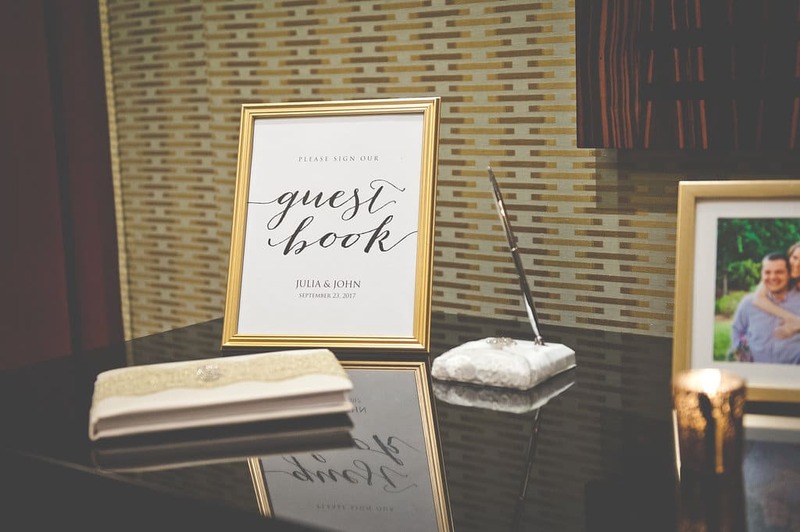 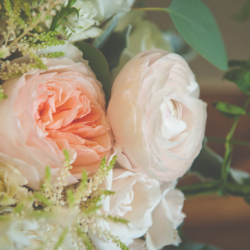 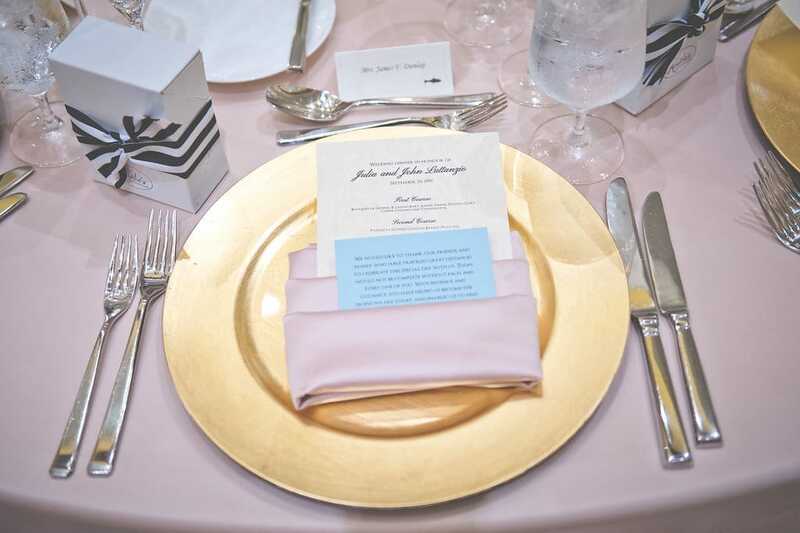 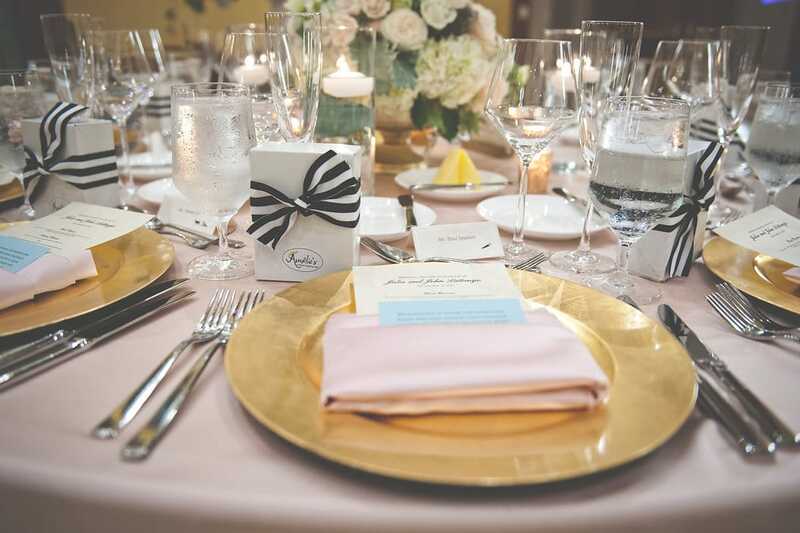 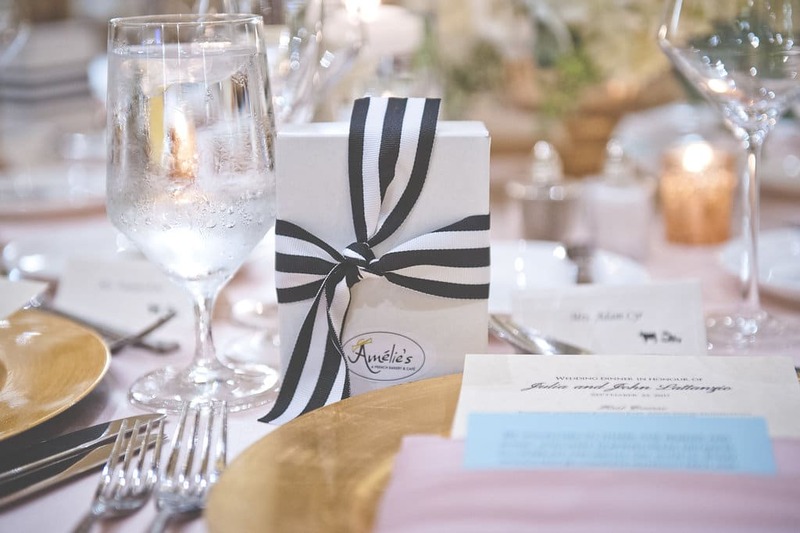 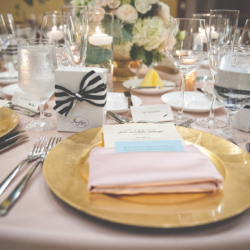 They had blush pink touches with ivory linens, and salted caramel brownie favors for each guest! 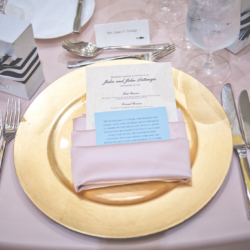 I loved the gold patterned plates Julia chose for her meals to be served on. 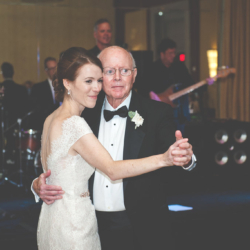 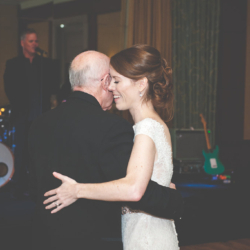 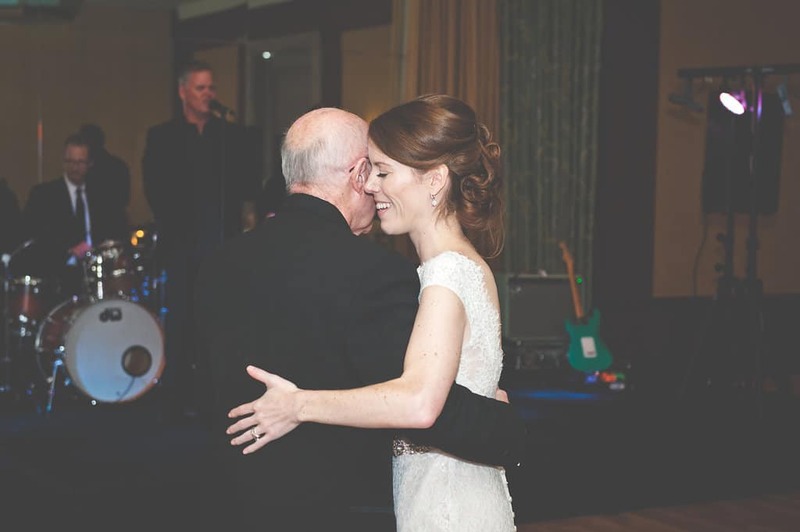 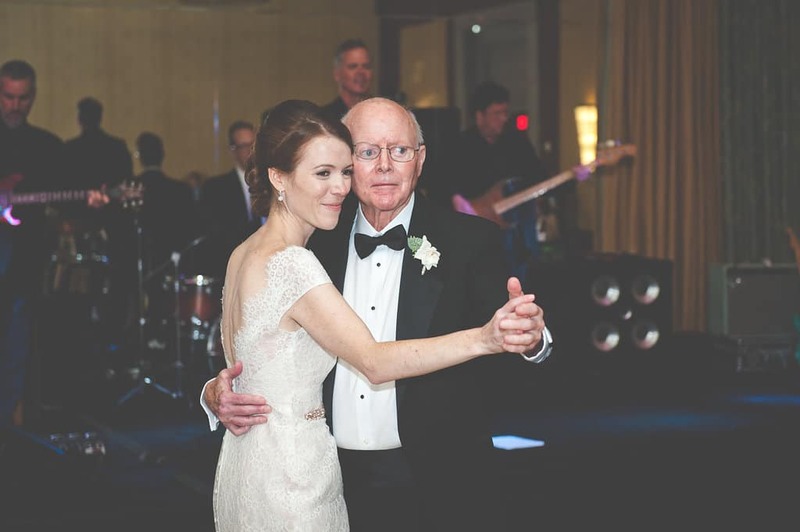 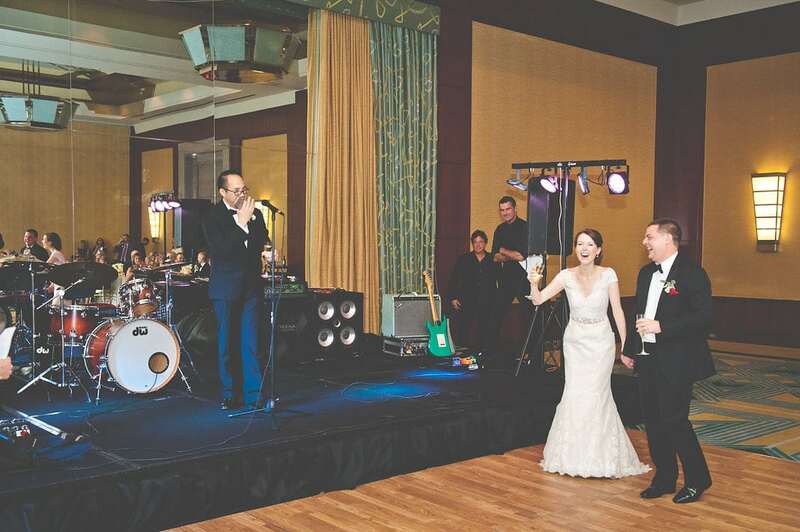 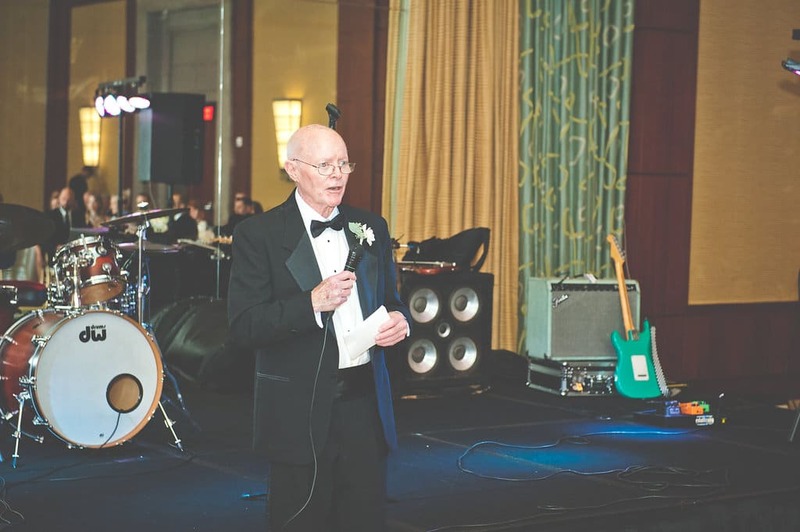 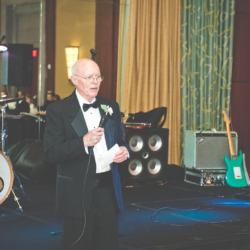 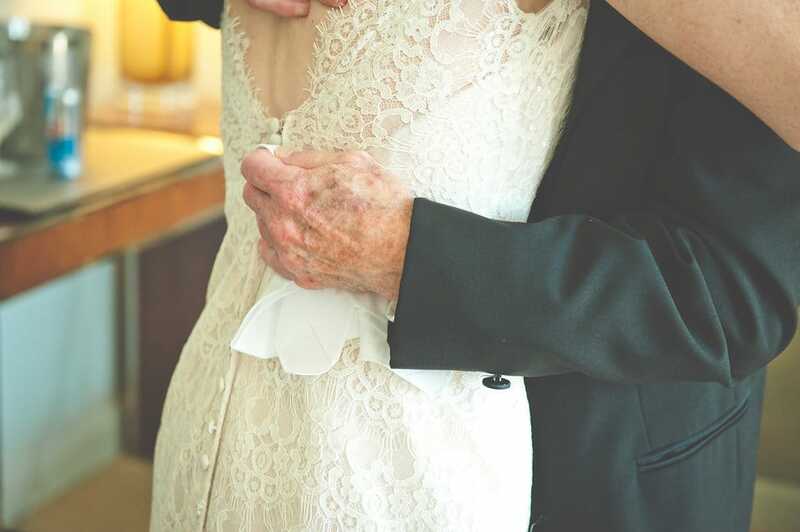 Julia was worried about her father during his speech and dancing, but he was having fun with everyone out on the dance floor! 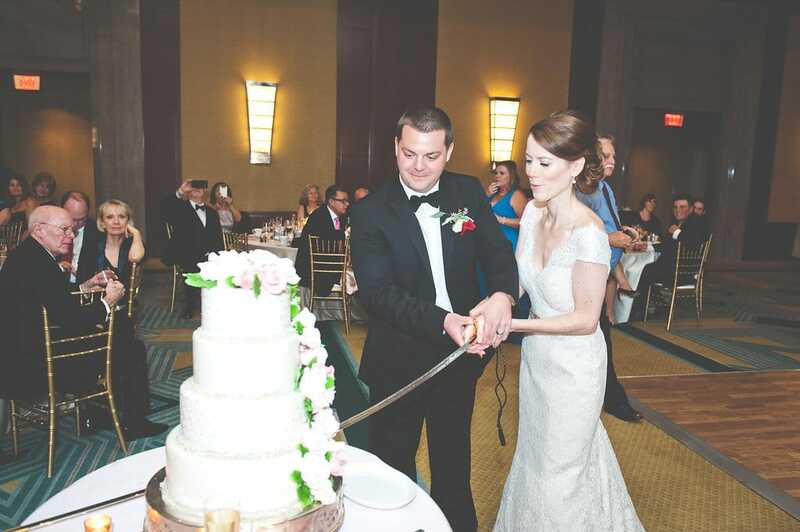 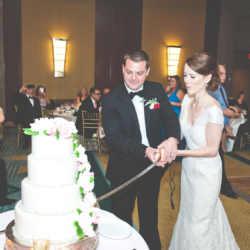 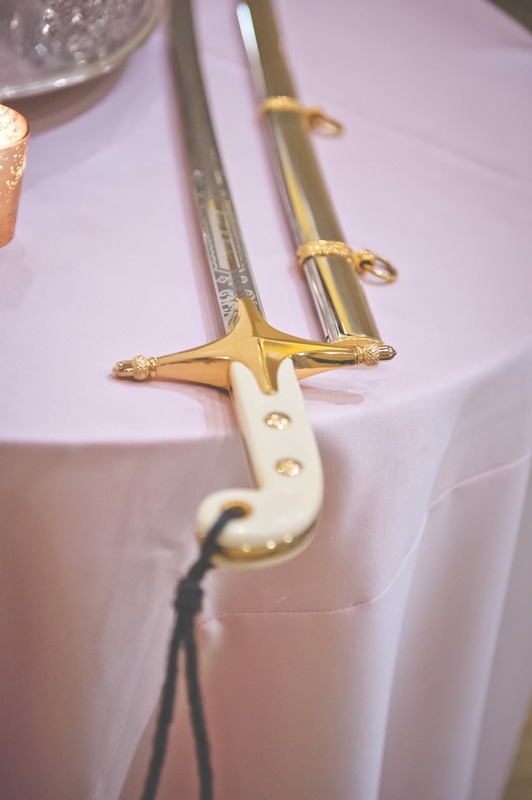 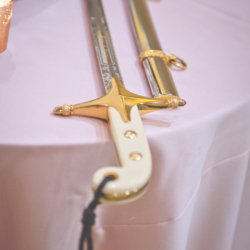 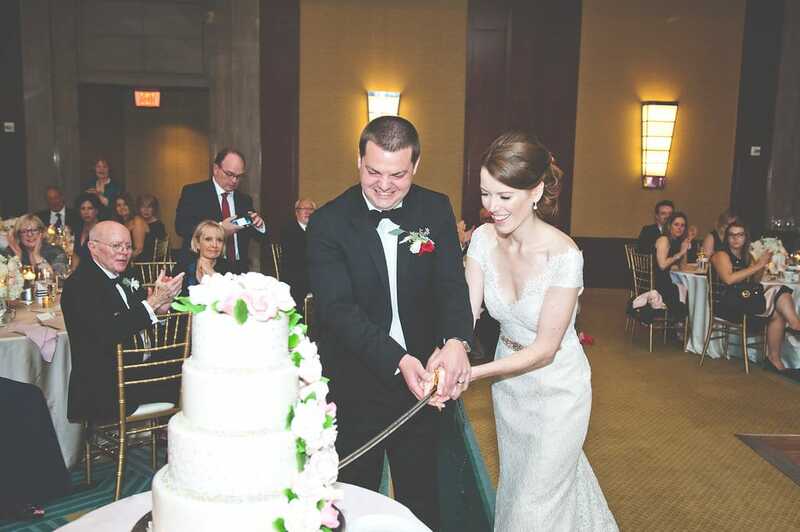 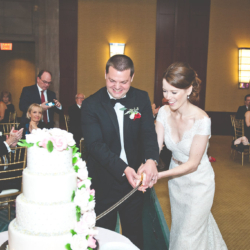 She used his sword from his military days to cut their wedding cake, a time-honored military tradition. 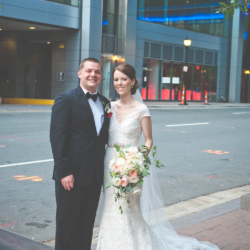 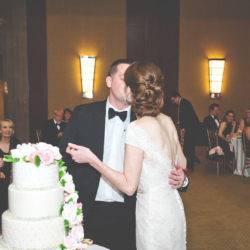 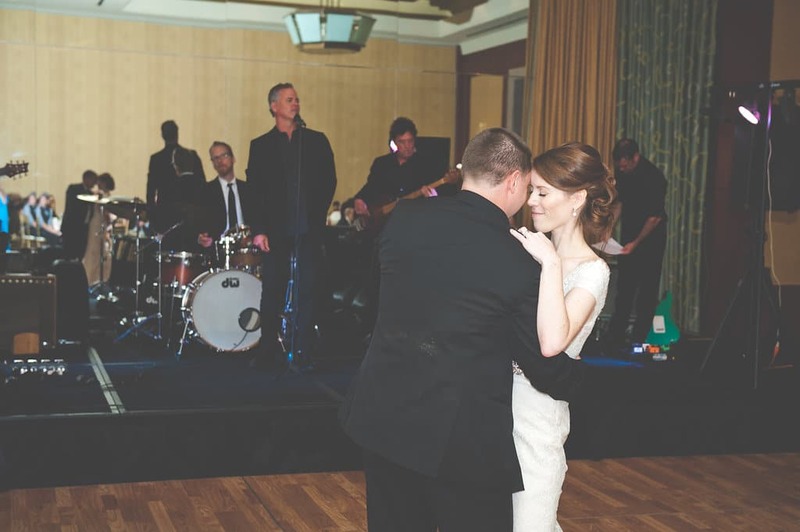 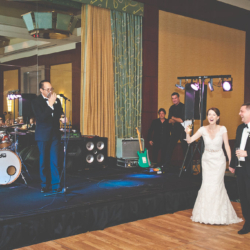 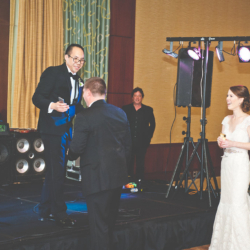 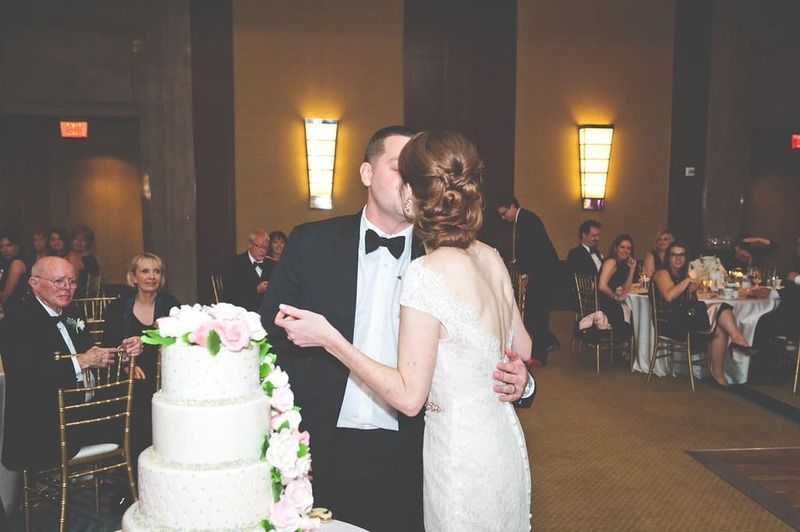 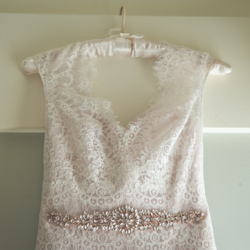 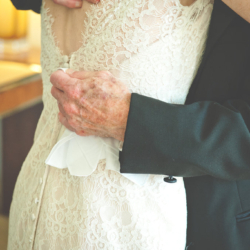 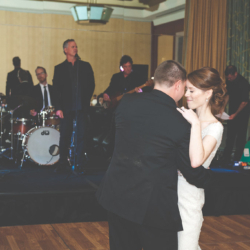 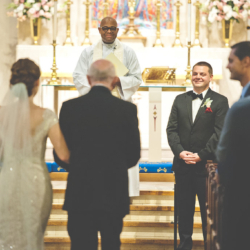 Julia and John met at an Italian restaurant in Virginia on Christmas Eve night. 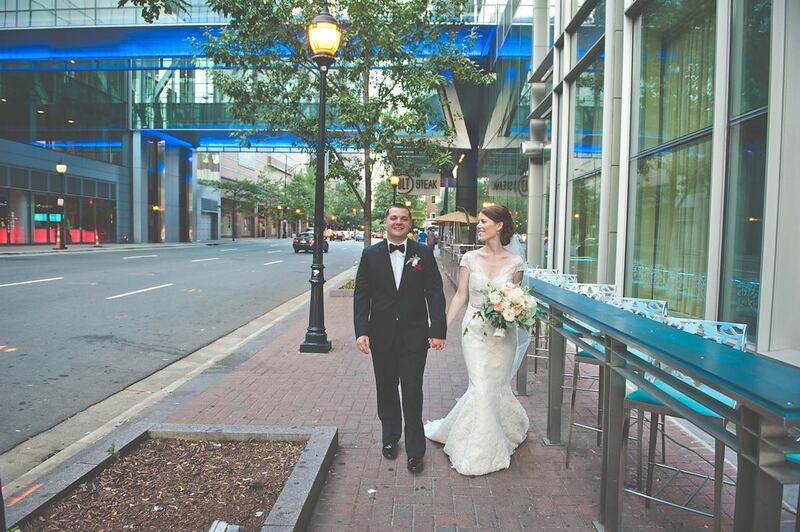 What a serendipitous evening! 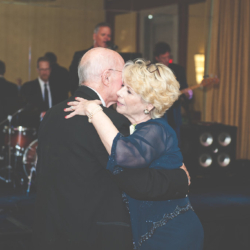 They even go back every year on Christmas Eve, now with their families. 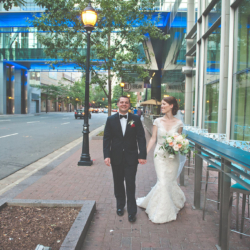 They have been inseparable ever since then and love to take their dog for a walk. 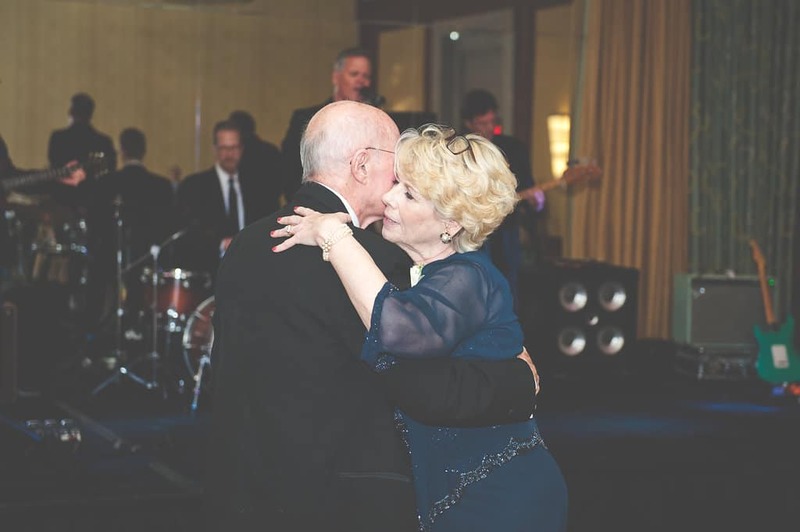 They are a really fun couple that you can find out at a brewery making new friends or grilling at home, having fun. 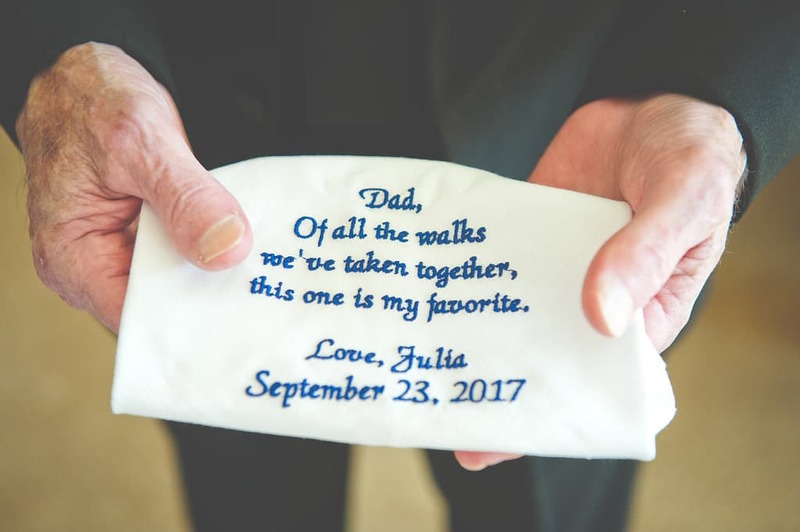 Julia is seriously one of the sweetest people I have ever met, and her family is just like her! 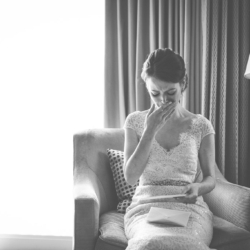 She sent us the sweetest thank you gift and most thoughtful thank you note I have ever received. 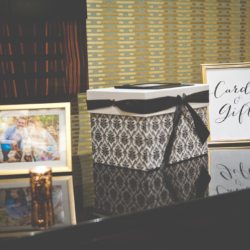 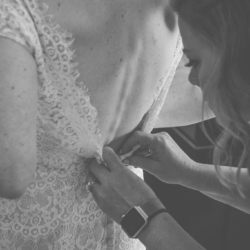 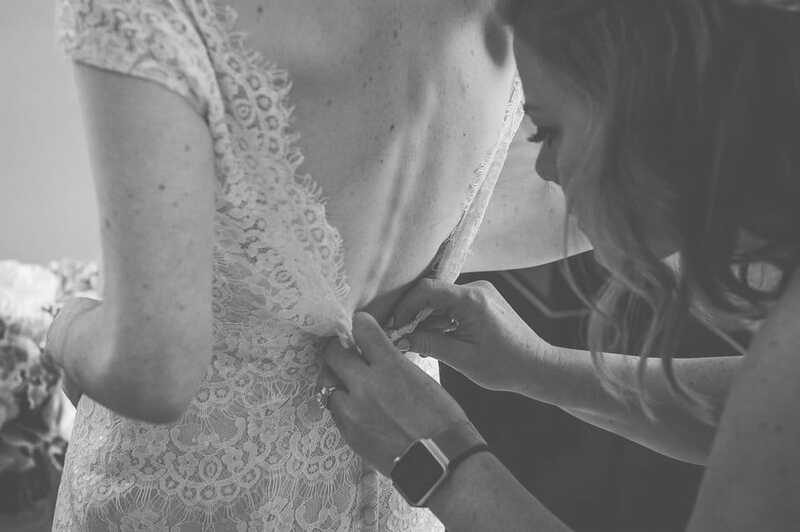 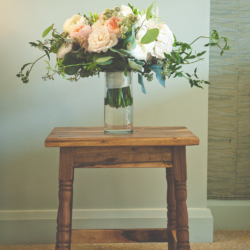 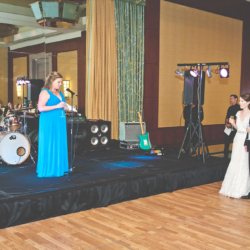 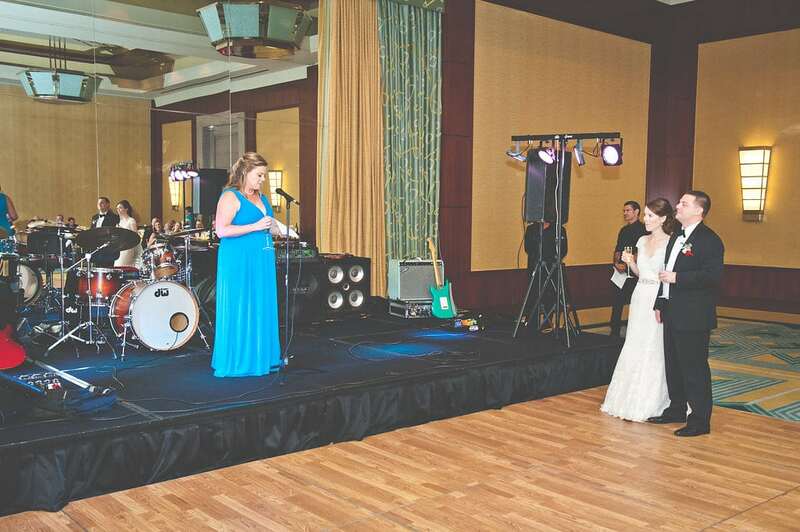 What’s funny is, her sister mentioned something very similar to us that night too – “you and your team share your hearts with couples all year long and make the very best memories for them that last a lifetime”. 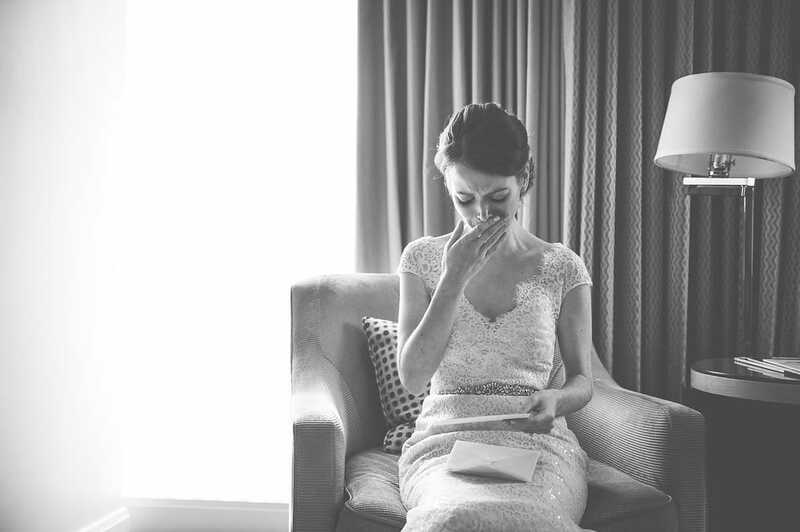 I think that perfectly sums up what we do so well. 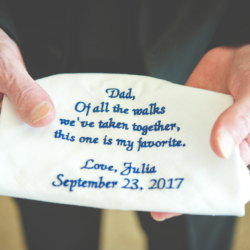 Julia, we love your spirit so much and we can’t wait to keep in touch with you and John over the years! 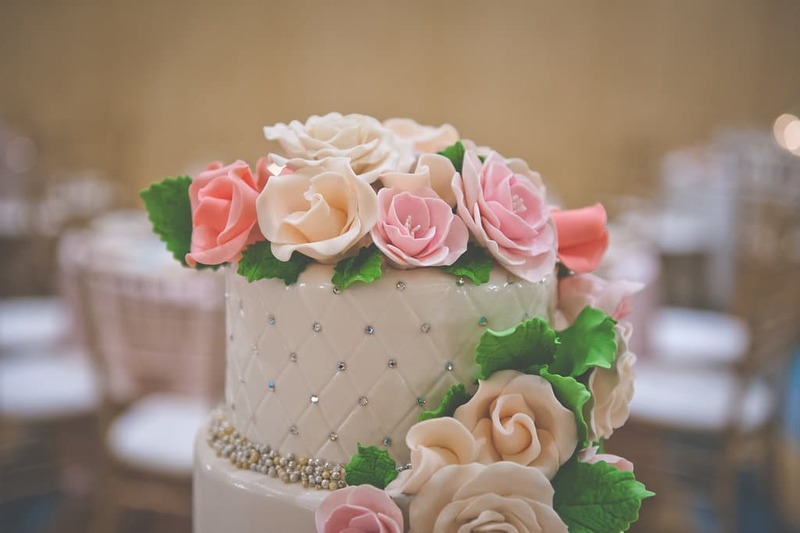 You are the sweetest person to everyone around you, and it really shows in everything that you do.